The Best Body Weight Exercise You Can Do - Basic Burpee | Valet. Pro athletes, CrossFit addicts and elite military forces swear by it. It's one of the most effective and most feared moves in all of fitness—the burpee. A punishing full-body exercise that everyone from pro athletes and CrossFit addicts to elite military forces swear by. And here's why: the high-intensity move combines strength training, endurance building and fat burning in one relatively simple move. Best of all, it requires nothing but your will and determination. Invented in 1939 by physiologist Royal H. Burpee as a way of testing one's fitness levels, he used the exercise as his thesis for a doctorate from Columbia University. The military adopted it a few years later as part of its fitness test for men enlisting during World War II. 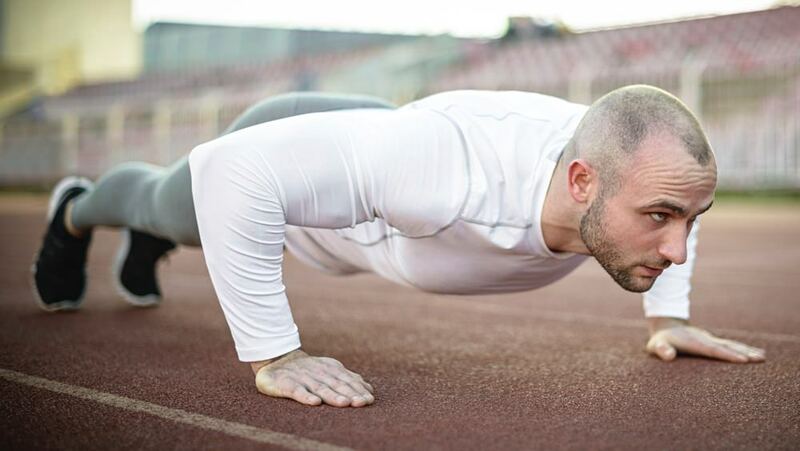 Over the past seven decades, the burpee has evolved into an intense multi-move exercise that delivers three times the benefits of standard moves like jumping jacks or pushups. "It's one of the most taxing body weight exercises you can do; it requires so many muscle groups—your glutes, quads, core, shoulders, and on," says Mark Zarubi, a Nevada-based trainer who is the Guinness World Record holder for most burpees executed in a day (18,896, in case you're wondering). Thankfully, you don't need to do that many to see some real benefits. And while the burpee now comes in all kinds of variations, you can't go wrong with the gold standard. Here's how to master it. Bend at the knees, getting into a squat position with your hands on the floor in front of you, just outside of your feet. Kick both feet back, assuming a pushup position. Immediately jump your feet back to the starting squat position. Explosively leap into the air, reaching your arms straight overhead. Make the move even more effective by adding a push-up after kicking your feet back. Known as the "Descending Burpee Ladder" this workout starts with a set of 10 burpees. Rest for a full 60 seconds. Then do a set of nine. Rest one minute. Work your way down, lowering reps by one until you reach just one final burpee.